So runs on the poem “Choroi bhati”. And it is this poem, which most of us were coerced to memorise (and produce in our exam scripts verbatim), that captures the true essence of 'choroi bhati'. The term may appear meaningless to the younger end of the age spectrum. However, occasions such as these are not only many people's favourite pastime, 'choroi bhtati' has become deeply embedded in our cultural infrastructure. Often termed as “jholabhati” or “bonbhojon”, 'choroi bhati' is a children-version of picnic. It is a small-scale cookout that can take place in fields, yards or even on the rooftop. What seems like child's play is, in real terms, not that simple. There are rules, responsibilities, duties and rituals. After all, this is not mere pretence- it is real cooking. 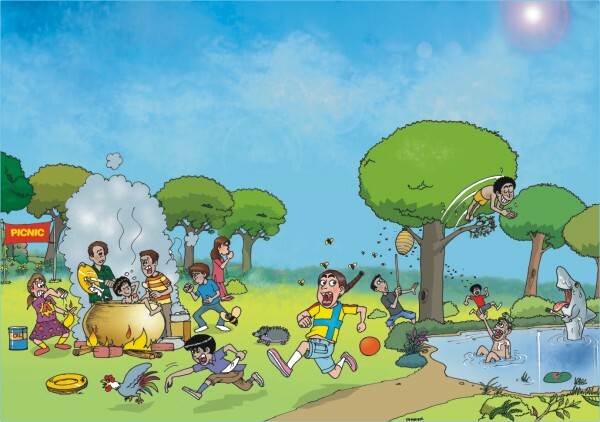 The usual scenario is something like this: a few youngsters get together, and invite their friends and fellow children in the neighbourhood to join in for a cookout. Everyone contributes. With all the ingredients and utensils set out… the game begins. The excitement that marks 'choroi bhati' is contagious. Everyone is in the mood to execute their duties and obligations. Once that is done, it is the time to wait for the cooking to be done. Scuttling and shuffling around the stove (the epicenter of the occasion), only one question bombards the mind: 'When can we get to eat?' The aroma that wafts past only serves to whet the appetite. Sadly, with life running on the fast track these days, children today rarely have the time for such activities. They have become captive to the computer, television and video games. Nevertheless, some still like to unwind for a while and uphold the much-valued tradition. Fatima Nawmee Rishta, a student of law, is one such person. “I still consider 'choroi bhati' fun. Some things just stay with you. The toughest (but undoubtedly, the most interesting!) part of it is lighting the stove- you have to blow in air hard till it lights. Mind you, it gets real sooty and smoky, and it stings your eyes. This can be seen as an interesting variation to the typical 'choroi bhati'. If the city life takes too much toll on your schedule, you may consider weekend escapades- while the elders can use this time to unwind, the children can have their picnic. There may be other attractive twists, too. Perhaps dumping utensils can be an option. The alternative? Banana leaf. Not only is it fun to eat out of, it is a thrill of its own to hunt for the leaf. No matter how catalysed our lives have been metamorphosed to, 'choroi bhati' is a timeless aspect of the Bengali culture. It represents the spirit, the passion, the zest of our merrymaking.